Create new purchase order from Replenishment or from Purchase order list, add items to it and Save. Optionally Save purchase order in your inventory management system (if available). Download or Email the purchase order to your supplier. Receive items (fully or partially) as they arrive. Optionally Update quantities in your connected system. Close the purchase order when you are done with it. All changes in purchase order update on order quantities and replenishment suggestions for corresponding variants. 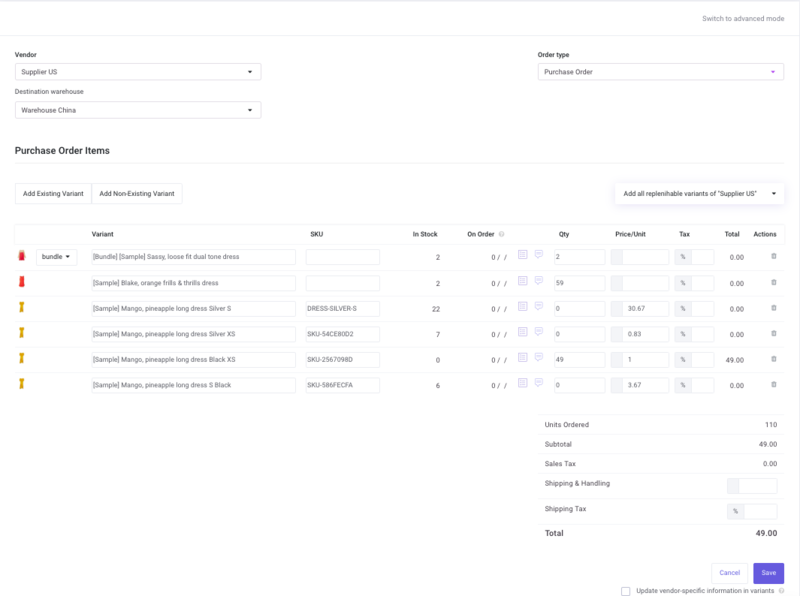 Inventory Planner closely integrates with purchase order functionality in inventory management systems (TradeGecko, Brightpearl, Ordoro, and Vend) when available. After creating a purchase order in Inventory Planner, you can optionally Save it in the inventory management system. Any further updates to the purchase order (including receiving items) should be done in the inventory management system. Inventory Planner will download use any updates about all purchase orders in the inventory management system. 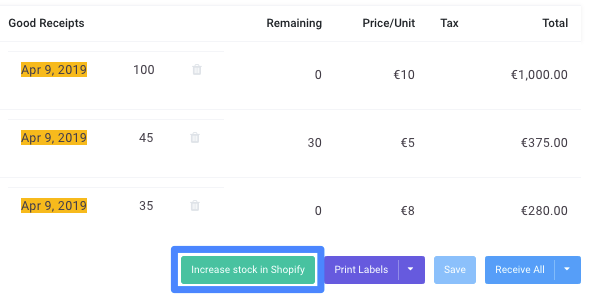 If you use a system that does not provide full-featured purchase orders (for example, Shopify, BigCommerce, or Magento), you can optionally increase stock after receiving items in Inventory Planner. 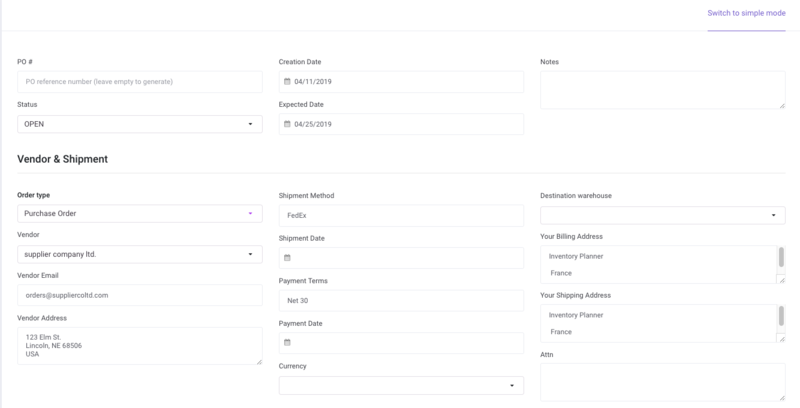 Here you can view your purchase order, filter by status or product name and create new one from scratch. You can view purchase order details by clicking on purchase order title number/title. To customize information showing on the dashboard, click the gear icon in the upper right corner to enable or disable columns. You can also create new purchase order directly from Replenishment. Once you have reviewed Inventory Planner replenishment suggestions, filter or select several variants in Replenishment view. and create a new purchase order for them. In your purchase order, click on 'Switch to Advanced Mode' to see all vendor and PO detail. The data for your vendor is saved and filled automatically if available. Several settings are available for customizing the columns that are included. You can add items to purchase order by searching for existing products or adding a line for new product. You can also add all products with non-zero replenishment suggestions for a vendor. Mark items as partially received by entering quantity in Received column and clicking on save icon. Close purchase order if you don't expect any more items to be received. Clone purchase order, Cancel or Delete it completely from the system.